The 92nd Annual Slovak Day will take place Thursday July 16, 2015 at Kennywood Park, West Mifflin, PA. It will be an exciting day for Americans of Slovak descent to celebrate their heritage with each other while enjoying colorful displays, authentic costumes, a Slovak liturgy, spectacular Slovak Dance performances, scrumptious Slovak food, special children’s activities, as well as foot-tapping music for dancing. (412) 373-3873, or use the contact form found by clicking here. For more about this event click here. Learn about Slovak Easter customs. Reservations are required by phone (contact Angie at 412-373-3873) or at rehearsal by March 20th. PÁS debuts its 2013 program at the 90th Annual Slovak Day at Kennywood Park. Songs and dances for this year’s program come from the Górale region of Slovakia, located in the high Tatra mountains. Click here to read more about the PÁS 2013 Program. 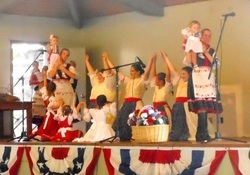 Additional event highlights include an Odpust (Forgiveness) Pilgrimage display created by the PÁS Junior Group, a Walk with Mary by members of Malý (Little), the Slovak Food Kitchen featuring traditional Slovak entrees and delicacies, a Slovak Mass, and performances by additional Slovak ensembles, including the Pittsburgh Slovakians. Members of the PÁS Junior and Adult groups will be available throughout the day to answer any questions related to the children's display, PÁS membership, and general group information. Purchase Slovak Day tickets through PÁS and help support our ensemble and other Slovak organizations throughout the Pittsburgh region. Click here to order tickets in advance or call (412) 373-3873. Tickets include an all-day ride pass for Kennywood Park. PÁS Delights Audiences at U.S. Embassy in D.C. This month PÁS was honored to delight international audiences with the production of four shows at the United States Slovak Embassy in Washington D.C. Songs and dances came from the Horehron and Eastern regions of Slovakia and included music provided by members of the PÁS orchestra. November 2, 2012 - Members of PÁS proudly showed off their costumes at this year's Pittsburgh Light Up Night Press Conference. The group is scheduled to perform on November 24th at the The Peoples Gas Holiday Market™in Downtown Pittsburgh's Market Square. The Peoples Gas Holiday Market will feature regional, national, and international vendors to showcase authentic gift items from around the world that can’t be found anywhere else in the City, including quality collectibles and novelties from popular foreign countries such as Russia, Switzerland, and Italy. Entertainment will be provided by a variety of performers, including local dance groups, choirs and carolers, showcasing Pittsburgh’s rich cultural heritage. For more information about this event click here. To view the press release and video click here. PÁS will have the honor of entertaining the president of Slovakia, Ivan Gašparovič, at the New Jersey Slovak Festival on Sunday, September 23rd. The festival will take place at the PNC Bank Arts Center in Holmdel, NJ. For more information about this event, visit our Events page. On August 26th PÁS held a fun-filled picnic at Monroeville's Evergreen Park in Monroeville, PA.
Open to PÁS members, family and friends, the event featured a variety of Slovak and American food, Slovak-themed games for the children, a water balloon toss, and an exciting game of volleyball. PÁS hopes that this will be an annual event in the years to come. Click here to view even more pictures of the 2012 Picnic. Slovak Day at Kennywood 2012 A Hit! We had so much fun at Kennywood and hope you did too! The PAS Adult Group debuted our 2012 performance in Pittsburgh featuring competitive stamping dances. PAS Junior and Maly groups danced to a playful set of children's dances. The children's display featured Popluska, the Slovak Cinderella story. Here are just a few pictures. More coming soon! PÁS performs a new program each year at Kennywood's Slovak Day. Additional event highlights include performances by the Pittsburgh Slovakians, a display created by the PÁS Junior Group, the Slovak Food Kitchen featuring traditional Slovak entrees and delicacies, and a Slovak Mass. Ticket includes all-day ride pass for Kennywood Park. Click here to order tickets in advance and support to support this worthy event.